Spartanburg Community College (SCC) has reached a record enrollment of 6,008 students for fall, 2011, with an increase of more than 41 percent in online enrollment. According to Dr. Jones, a higher number of returning students contributed to the fall enrollment increase. “Our faculty and staff developed and implemented effective strategies to attract and retain students. Faculty, department chairs and deans developed several new programs in high-growth, high-demand fields such as medical coding, emergency medical technician/paramedic and production associate technology, which also contributed to the enrollment growth. Registration for spring 2012 classes that begin on January 9 is going on now. For a complete listing of all class schedule offerings, visit www.sccsc.edu/academics/search.aspx. For the best selection of classes, prospective students should enroll now. Individuals interested in applying to the College can contact the SCC Admissions Center at (864) 592-4800 or toll free (866) 591-3700 or apply online at www.sccsc.edu. Named one of the fastest-growing colleges in the nation according to Community College Week, SCC offers more than 100 academic programs of study including associate degrees, diplomas and certificates, plus University Transfer opportunities to four-year colleges and universities. SCC provides flexible class scheduling including day, evening, weekend classes with multiple start dates and more than 100 online classes through SCCOnline. Offering the lowest tuition in the region, convenient locations, and regional/national accreditations, SCC offers educational opportunities leading to high-growth, high-demand jobs. The SCC Corporate & Community Education Division provides job and career enhancement, workforce development and personal enrichment courses and training programs. For more information, visit www.sccsc.edu. Spartanburg, S.C. – Spartanburg Community College offers a second chance to high school dropouts and students at risk of dropping out through Gateway to College – a national dropout recovery program designed for young adults ages 16 to 20. Eligible students will be dually enrolled with their sponsoring high school and SCC, allowing them to earn college credits while completing their high school diploma. Each student receives a detailed and individualized academic plan and ongoing support from a resource specialist who serves as coach, mentor and advisor. During the students’ first term, they take classes exclusively with other Gateway to College students, including a “college survival and success” course that focuses on study habits, time management, test-taking strategies and other techniques critical to succeeding in college. After the first semester, students are mainstreamed into courses with other SCC students. Students who graduate from the program have the opportunity and the necessary skills to continue on to earn a college degree. Nationally, Gateway to College graduates earn an average of 46 college semester credit hours (73 quarter credit hours) as well as their high school diploma – which means the students, on average, are more than two-thirds of the way to a college degree after completing the Gateway program. SCC began the Gateway to College program in fall of 2009 with a $300,000 start-up grant from the Wal-Mart Foundation and funding from the seven Spartanburg County School Districts. The Gateway to College National Network is part of the Early College High School Initiative, funded by the Bill & Melinda Gates Foundation, in partnership with Carnegie Corporation of New York, The Ford Foundation and the W.K. Kellogg Foundation. The SCC Gateway to College program is now accepting applicants for the spring 2012 semester, beginning January 9. An information session will be held on Tuesday, December 6, at 4 p.m. on SCC’s central campus in the East Building, Room 25. Reservations are required to attend – call 864-592-4267 or 864-592-4263. Registration for spring 2012 classes is ongoing now for classes that begin on January 9. For a complete listing of all class schedule offerings, visit www.sccsc.edu/academics/search.aspx. Individuals interested in applying to the College can contact the SCC Admissions Center at (864) 592-4800 or toll free (866) 591-3700 or apply online at www.sccsc.edu. Give an SCC Gift Card! Are you searching for the perfect gift for someone special? Do you know someone who is creative and would like to learn how to use a camera properly or make and design jewelry? How about someone who is interested in or needs to make a career move? Maybe you have a loved one who wants to learn Photoshop or even Spanish. 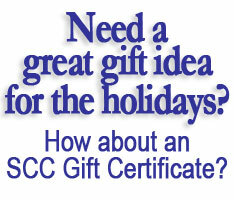 Give them an SCC Corporate & Community Education gift card. Your gift will make a positive difference in your loved one’s life. Check out SCC’s class offerings for the upcoming new year. SCC Gift Card: a magnificent gift idea!